Is it possible to make high-compressive-strength cement on Mars? I was having fun reading this article about making cement on the moon when I asked myself (and now you), is it possible to make a suitably high-compressive-strength cement on Mars? Since concrete is simply cement with rocks in... I'm only asking about cement. I'm assuming absolutely nothing other than the recipie can be brought with astronauts (piles of dirt and a bazzillion gallons of water being a bit heavy to lift off the Earth). The construction site is on the equator. The best answer will explain how locally home-grown cement can be made at the equator without laying thousands of miles of pipe (or any other impractical solution) from the poles to the construction site. "Can it be done?" obviously depends on accessibility of materials. However, it's not posible (OK, it's not practical...) to bring an entire construction company to Mars. There are machinery limitaitons. 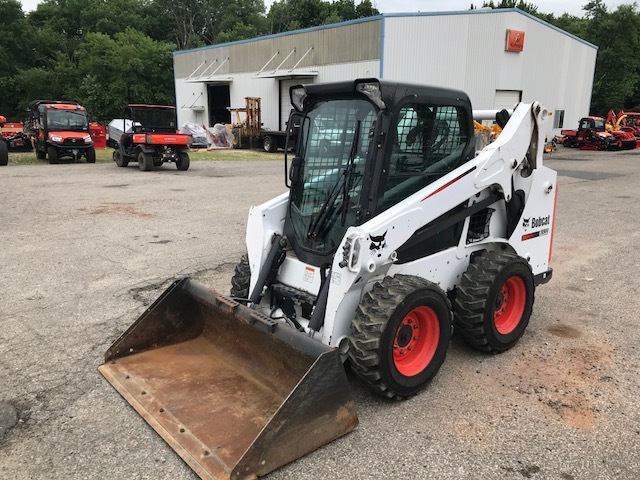 Ignoring all the logistics: you have one mini-excavator, one bobcat earth mover, some kind of big spinning tub to mix the cement, drilling equipment suitable for tunnel work, and a reasonable amount of handheld machinery. All suitably modified to work on Mars. I don't want to worry about the specifics on this point (don't quibble about fuel, etc. ), it's not the focus of the question. Assume the equipment works, but you don't have the ability to bring anything and everything you might want. Other than I'm ignoring our actual lack of present ability to get a ship to Mars — assume current technology. And just to keep the minimalist answers at bay, I'm asking for hard science. Are all the materials accessible and can they be be successfully assembled? Let's get empirical. The good news is research into martian concrete has been done. Researchers think regolith on Mars could serve as a replacement for concrete components. The Mars rovers have used gas chromatography, mass spectrometry, and laser spectrometry to determine the composition of martian soil. Mars regolith is mostly silicon dioxide and ferric oxide, with a fair amount of aluminum oxide, calcium oxide, and sulfur oxide. The composition varies from place to place on the planet’s surface because of variability in asteroid collisions and the weathering by wind and water, in ancient oceans and in some modern water flows. But no spacecraft has returned to Earth with actual samples of the material. But will it be easy? Perhaps not. There's a lack of water. On Earth, concrete cures and strengthens thanks to the chemistry of cement, which consists of limestone and water. However, most limestone on Earth was formed by sea creatures, which Mars never had. Martian soil has the calcium and carbon found in limestone, but the elements are scattered around the planet. And Mars has water but it’s not plentiful. “It’s going to be a long time before we can produce cement on another planet,” says Gianluca Cusatis, a professor of civil and environmental engineering at Northwestern University. However, sulpur can be used as an alternative. What Mars does have is a lot of sulfur in its soil, and molten sulfur has been used to bind some concrete on Earth. To test the possibility of using it to make martian concrete, Lin Wan-Wendner, while a Ph.D. student in Cusatis’s lab, melted sulfur and mixed it with JSC Mars-1a in a ratio of 1:3, the same recipe used for sulfur concrete on Earth. She then subjected the concrete to standard tests of its strength under compression, bending, and splitting. Using Earth sand, that recipe produces a compression strength of about 30 megapascals, similar to that of cement-based concrete. But the simulated martian concrete was much weaker, which may have been because the material was more porous than the Earth version, Cusatis says. More porous concrete is usually a result of larger particles in the sand. Fortunately, this problem of weaker sulpur-based concrete can be overcome. When Wan-Wendner, now a researcher at the University of Natural Resources & Life Sciences, Vienna, and colleagues tried a sulfur-to-sand mix of 1:1 and compressed the mixture to break down grains and drive out air bubbles, the resulting concrete had a strength of 60 MPa, twice as strong as standard concrete. Sulfur-based concrete also hardens quickly, in the time it takes for the mixture to cool. Regular concrete takes 28 days to completely cure and gain its full strength. The quick setting may be an advantage for 3-D printing, Cusatis says, because it means each layer of the material will almost immediately be strong enough to hold the layer printed on top of it. This isn't the only way to make martian concrete. Another proposal for martian building materials eliminates a binder altogether. UCSD’S Qiao discovered that he could turn a regolith simulant into bricks by simply compressing the material rapidly. The soil is full of iron oxide and oxyhydroxide particles about 25–45 μm across. “If you compress the soil grains at high enough pressure, you are going to cleave those iron oxide nanoparticles,” Qiao says. The breakage gives the nanoparticles clean, flat surfaces. Under further pressure, they rotate so that the tiny, freshly cleaved facets press against each other and form a bond. Qiao believes the nanoparticles bind to each other through a mix of van der Waals forces and atomic bonds, though he hasn’t tested that assumption. What’s more, the binding happens in just about a millisecond under 400 MPa of pressure. That is about the same amount of pressure produced by dropping a hammer on the soil, Qiao says. And that is essentially what his team did. Similar processing can be used on other forms of martian soil too. Another type of soil common on Mars is a sedimentary, claylike material formed in ancient oceans. It has the same chemical composition as other regolith, but weathering by water long ago means it has a fine-grained structure with no nanoparticles and an electrostatic surface charge. Qiao found that compacting layers of a replica of this dry Mars clay under high pressure also created a solid material. The layers of the clay became naturally aligned under pressure so that electrostatic forces held them together. But rather than striking the material rapidly, the researchers slowly squeezed the clay layers together. The two soils produce “similar strong solids,” Qiao says. Other methods for making concrete have been considered. This involves 3D printing techniques. In Mueller’s lab at NASA, researchers are testing polymers as a binder for the regolith. It should be possible to manufacture polymers, such as high-density polyethylene, on Mars using carbon dioxide from the atmosphere and hydrogen from water in the soil, Mueller says. With a 3-D printer, his lab built a dome 1 m in diameter out of their simulated Mars concrete to show what they hope to do on a larger scale. Of course, 3-D printing with concrete is challenging, Mueller says. The deposited material has to be thick enough to hold its shape during the printing process but thin enough that it doesn’t clog the machine or dry so fast that it cracks. “The trick is getting a material that has the right consistency so that it can be extruded and it can cure,” he says. Mueller would like eventually to skip the polymer binder and instead harden the soil by sintering it—that is, heating and compressing it until it becomes solid. That should be possible using a laser beam, a solar concentrator, or a microwave system. But until researchers develop that technology, they’re using the polymer binder to test their 3-D-printing ideas. In conclusion, there are number of possible proposed methods of making concrete on the planet Mars. Research has already been conducted. The results are promising. presumably more research will be needed. There are questions about durability that may need to eb resolved. It is feasible concrete will be made from regolith on the Red Planet. As shown by preliminary research. Neil Savage, "To build settlements on Mars, we’ll need materials chemistry," Chemical & Engineering News, Volume 96, Issue 1, pp. 16-18. (Issue Date: January 1, 2018 ; Web Date: December 27, 2017). Lin Wana, Roman Wendner b, Gianluca Cusatis, "A novel material for in situ construction on Mars: experiments and numerical simulations," Construction and Building Materials, Volume 120 (2016) pp. 222–231. It is likely possible, but water availability would be the limiting factor. The article you linked already shows that the elemental constituents of cement are mainly Oxygen, Silicon, Iron, Calcium, and Aluminum... which are the most abundant elements in the Lunar regolith by a wide margin. Assuming that the rock formations near your lunar base are chemically similar to the rocks we process for concrete here on Earth, processing all the silicates, aluminates, and ferrites into Portland cement should not be a significant difficulty. The biggest difficulty would be sourcing enough water to mix with all that Portland cement, aggregate, and sand to make concrete. The article you mentioned states that there is approximately 1kg worth of water per cubic-meter of lunar soil (presumably this means about ~111g worth of hydrogen per cubic-meter, since oxygen is overabundant). This scarcity would mean that you'd have to process vast amounts of lunar soil for the water needed to mix into your concrete. You're probably better off just sintering/melting the regolith to make construction materials. The scarcity of water would be a huge limiting factor for your construction plans. Furthermore, the need for water for biological functions would likely make it far more valuable for those applications, and thus price it out of being a viable commodity for basic construction needs. Solar power is relatively abundant and limited only by the efficiency and square footage of the panels (and collection mirrors) you were able to transport. The same thermal processes you need to liberate that ~1kg of water from each cubic-meter of regolith can be tweaked to output other useful elements/compounds if you have enough energy at your disposal. That same cubic-meter of soil should provide about ~315kg of elemental Silicon, ~150kg of Iron, and ~90kg of Aluminum. With that in mind, there are myriad ways to create other high-compression-strength materials when water availability drives cost/strength ratios away from typical Earth-market-optimal solutions. For example, various glasses could be formulated from the available SiO2, Na2O, and CaO (though many Earth-typical glasses which use Na2CO3 would be production-limited by carbon availability on the moon). Fuzed quartz (which is essentially an amorphous glass made purely of SiO2) has a compressive strength of ~1.1GPa, which is much stronger than the ~20-40 MPa compressive strength of typical concretes. Basically, glasses and ceramics (in addition to metals and alloys) are likely to be the construction materials of choice on the Lunar surface. EDIT: The OP reminded me that their question was actually about applying the linked Lunar-concrete article toward producing Martian-concrete. The Curiosity rover found Martian soil to be composed of roughly 2% water by weight, which would be approximately 30kg per cubic meter of martian soil - which is a SIGNIFICANT boon compared to Lunar soil water. Martian solar energy collection would also have roughly 0.3-0.5 the output power of similar panels placed on the Moon due to the way solar energy scales with increasing distance, making the energy for "just melt everything" roughly 2-3 times as expensive on Mars compared to the Moon. As energy costs rise, and water costs fall, things will tend toward more and more Earth-like cost/benefit analyses. Whether that means hydraulic cement becomes large-scale more economically feasible than other water-less ceramics would require more research, but Portland cement production and use on Mars definitely seems more feasible there compared to the Lunar cement article you linked. Forget cement the key is dedicated Martian concrete. Mars is the most habitable planet in the solar system after Earth. In recent years, many countries, including the U.S., China, and Russia, announced to launch manned Mars missions in the next decades. Due to the dry environment on Mars, sulfur concrete concept is a superior choice for building a human village on the red planet. Studies of Martian meteorites suggest elevated sulfur concentrations in the interior. "At Northwestern University. These guys  have worked out how to make Martian concrete using materials that are widely available on Mars. And, crucially this concrete can be formed without using water, which will be a precious resource on the red planet." "The key material in a Martian construction boom will be sulphur, says the Northwestern team. The basic idea is to heat sulphur to about 240 °C so that it becomes liquid, mix it with Martian soil, which acts as an aggregate, and then let it cool. The sulphur solidifies, binding the aggregate and creating concrete." "in the 1970s, materials scientists studied the possibility of using sulphur concrete to build lunar bases on the moon. They quickly discovered that in a vacuum, sulphur sublimates—it turns from a solid directly into a gas. So any sulphur concrete on the moon would quickly disappear into the ether." "They used simulated Martian soil consisting mainly of silicon dioxide and aluminium oxide with other components such as iron oxide, titanium dioxide, and so on. They also tested various different sizes of particles in this aggregate." “The best mix for producing Martian concrete is 50 percent sulphur and 50 percent Martian soil with maximum aggregate size of 1 mm,” they say. And it is strong stuff, reaching a compressive strength in excess of 50 MPa, particularly if it is compressed during curing to reduce the formation of voids. Stronger than standard earth concrete. "the atmospheric conditions on Mars are suitable for this stuff. “Both the atmospheric pressure and temperature range on Mars are adequate for hosting sulphur concrete structures,” Martian concrete can be recycled by heating it, so that the sulphur melts. So it can be re-used repeatedly. It is also fast-setting, relatively easy to handle and extremely cheap compared to materials brought from Earth. 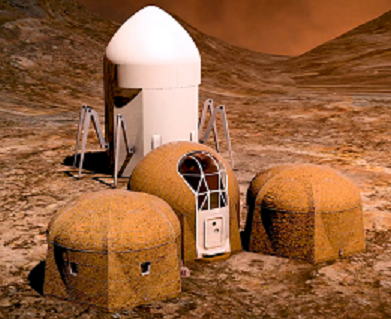 All we need now are a new generation of Martian architects to design buildings made of Martian concrete that will be suitable structures for humans to live and work in. Looking at the other answers, it seems concrete as we understand it is going to be difficult due to lack of water and limestone. I will suggest a few alternatives. Rammed Earth construction. 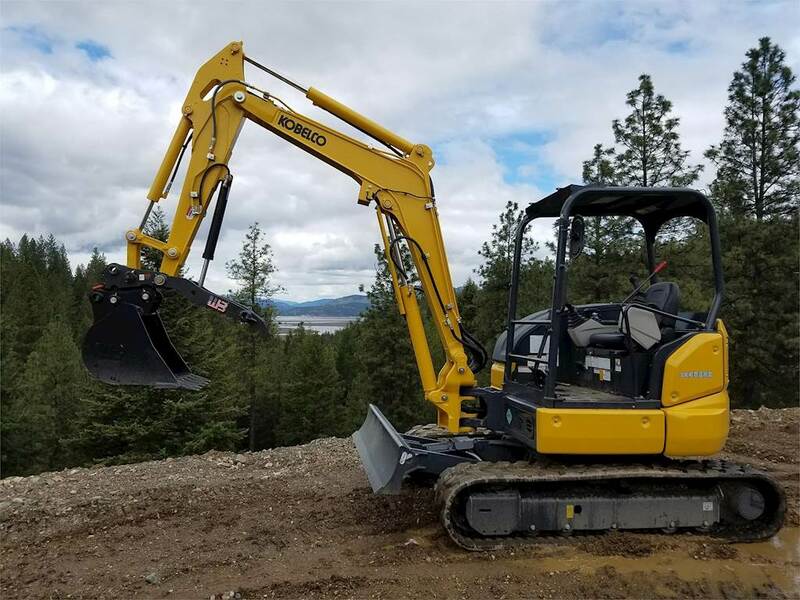 This is likely the least expensive option, and simply involves shovelling earth into forms which are then compressed by powerful hydraulic rams or an electrically powered equivalent. The rammed Earth blocks can then be stacked or otherwise used much like normal cinder blocks. They are inexpensive, sturdy, thick enough to provide radiation protection and can be made air tight by spraying the inner surface of a finished structure with some sort of sealant. Sintered material. Much like rammed earth, but adding heat to essentially "weld" the grains together more securely. This will be stronger, but still likely to require some sort of sealant to maintain air tightness inside. Alternatively, you could build a rammed or sintered earth construction around a landed spacecraft, landing module (such as depicted in "The Martian") or even a pressurized balloon (protecting it from atmospheric abrasion, solar and other radiation and even temperature extremes. Melted material/glass. This is much more energy intensive, but quite possible if you have lots of energy such as a nuclear reactor or giant solar mirrors. Glass blocks can be used as construction material, or alternatively heat energy can be applied to a structure made of rammed or sintered earth to turn the outer layer to glass. This makes the structure much more air tight (although there is always the possibility of cracks in the glass being weak points for air loss. Glass is also a brittle material, so backing the glass with rammed earth may provide much more security by having a "soft" backing layer. No numbers are provided since the materials making up Martian dirt are not known well enough to make any accurate calculations. Rammed earth blocks could be used for an interesting construction: a trench could be dug and the spoil used to make rammed earth blocks. 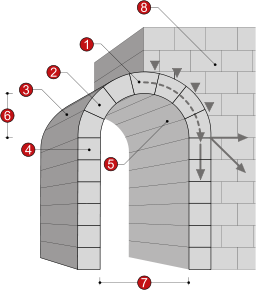 The blocks are used to form a barrel vault in the trench and the structure is backfilled to cover the arch and provide the compressive force to give the structure maximum strength. Once the interior is sealed, lights added etc, a fairly pleasant environment could be created. Not the answer you're looking for? Browse other questions tagged hard-science chemistry mars or ask your own question. Can we make rain on Mars? If we built a large moon close to Mars, could we make Mars a living world? Is it possible to make an alloy that melts at low temperatures and solidifies at high temperatures? Would it be possible to use geothermal energy on mars?